Successful Digital and Omnichannel Strategies Moving into 2017. Finding the most effective strategies for eCommerce success can be challenging. Trends and best practices change so rapidly that it can be difficult for retailers to keep up. 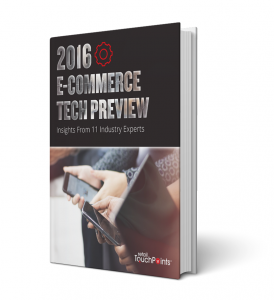 To ensure a successful 2017, Retail Touchpoints has collected the most effective go-forward business strategies for retailers in their second annual eCommerce Technology Preview. The guide offers an exclusive and unique look at how retailers are gearing up for eCommerce and omnichannel success in 2017 and beyond. It features insights from 11 eCommerce experts, best practices, trends, strategies, and technologies, and will help retailers of all types and sizes strategize for successful digital and omnichannel strategies moving into 2017.